WOW! Cheap flights to Paraguay: Ciudad del Este & Asuncion for €297! 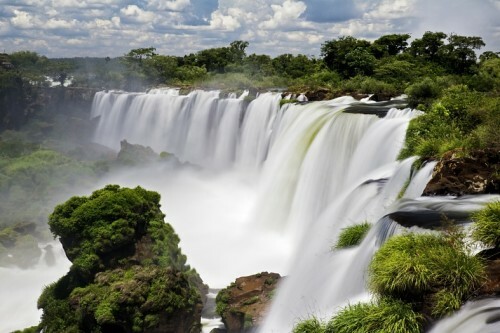 UPDATE 14.2.2019: WOW, super cheap flights to Paraguay (Asuncion) are now available from Paris for only €297! Usual tickets to Paraguay cost €800 or more, so this is a really massive saving! You can also get just 16 hour flight instead of the cheapest one (24-32 hours) for €327 which is still amazing price! Travel dates from March to May and from September to December 2019, e.g. 12.3.-28.3., 22.3.-7.4., 5.4.-15.4., 11.4.-24.4., 23.4.-8.5., 5.9.-19.9. or 3.10.-17.10. Hurry up and BOOK NOW, check screenshot. Very unusual destination is now on sale thanks to TAM’s new tariff. Multicity tickets Rome – Ciuded del Este – Munich are now available for €442! Regular price of flights to Paraguay is at least double this price so this is really unique and rare deal! There is one stopover in Sao Paulo on your way to Paraguay. Ciudad del Este is second biggest city in Paraguay and it’s almost at the border with Argentina and Brazil so you can use this ticket to visit those countries too. It’s also ideal starting point for visiting world famous Iguazu Falls, considered the most beautiful waterfalls in the world. Travel dates are from September until 6th December (departures) with unlimited length of stay. 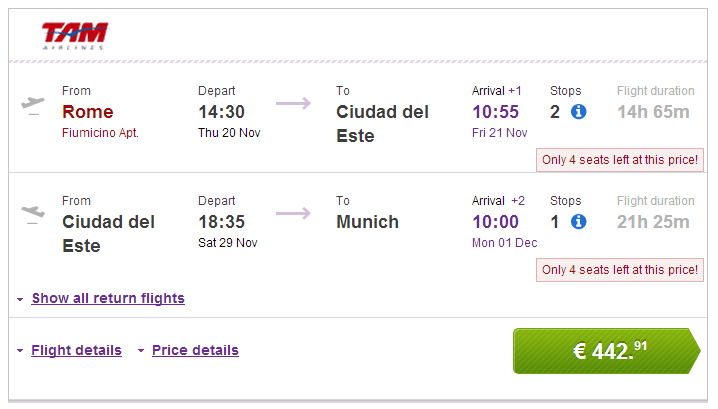 Book via BudgetAir to get this price (click on Show extra search options to enter return to Munich). Paraguay offers plenty of affordable accommodation options from cheap hostels to luxury hotel suites, so just compare the best deals with our hotel comparison page. « HIT! Cheap flights to Chile: Santiago de Chile for €365!